(NewsUSA) - Remember the last time you were at the beach and craved a spicy margarita? Or perhaps you were camping or at a tailgate party and all they served was beer and wine. The dream of on-the-go cocktails is now a reality and you no longer have to buy and carry multiple ingredients, or have a bartender handy, to be able to create your favorite cocktail at a moment's notice. Minute Mixology, a Venice, Calif.-based company, believes in making cocktails conveniently, using high-quality, low-sugar non-GMO, and gluten-free ingredients. In this way, the company says it has found a way to bridge the gap in the single-serve cocktail mixer industry and made it possible to bring the bar to you - wherever you are. "It's a convenient, high quality, stick-pack cocktail mixer, a perfect item for the cocktail connoisseur in your life to use anytime, anyplace," says BJ, McCaslin, a co-founder of Minute Mixology. "This product provides you with great-tasting craft cocktails made simple." In a time, when you see the spirit of entrepreneurship flailing, two friends decided there was a need for such a creation. McCaslin and Drew Whited already had tried their hand in other businesses in the space and were successful. For instance, McCaslin created a coconut water coffee that was acquired by Vita Coco out of New York and Whited found success in the online marketing business. Couple McCaslin and Whited's success with the company's other partner, Jason Trawick, a former WME Talent agent who worked with clients such as Taylor Swift and Britney Spears, and this trio is looking to revolutionize the cocktail industry. "It's not just about becoming the best cocktail mixer in this space, it's about innovation," says Whited, co founder of the company. "We are already selling out and planning to expand our brand and [are] designing new products." 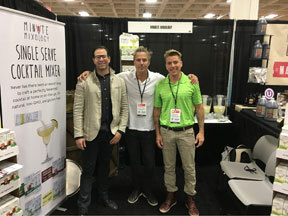 The team of Minute Mixology has been in the liquor space for the last two years while launching the cocktail mix in September of last year. Currently, the product is available online, and in stores in the Midwest and the South. The Spring 2018 Minute Mixology will be available in Target, Meijer, Raley's and World Market. Flavors include: Margarita, Moscow Mule, Spiced Old Fashion, Spicy Margarita, Coconut Mojito, and Michelada.